High Yield Ag Solutions (HYAS) is now offering a fully-automated network for ‘around-the- clock’ monitoring of soil moisture levels. This network includes high-resolution probes with 6, 9 or 12 sensors evenly spaced to a depth of 2, 3 or 4 feet below ground level. Moisture readings from all sensors are automatically collected at user-configurable rates and stored in a secure database server with password-protected access. 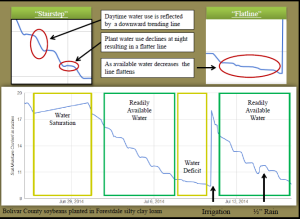 From the authorized user’s web browser, graphs can be viewed over the entire growing season for each probe and sensor clearly indicating crop water uptake and root development at all sensor depths, clearly indicating when irrigation is needed. This not only saves cost but significantly improves yield potential. The key is knowing when water deficiency stress is acceptable, and when its not, so irrigation can be applied only when required. 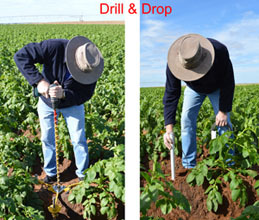 However, each field will likely vary by soil type, tillage and drainage conditions. Reading and understanding ‘real-time’ soil moisture conditions at depths from 4” to 4 ft allows users to make efficient use of water. 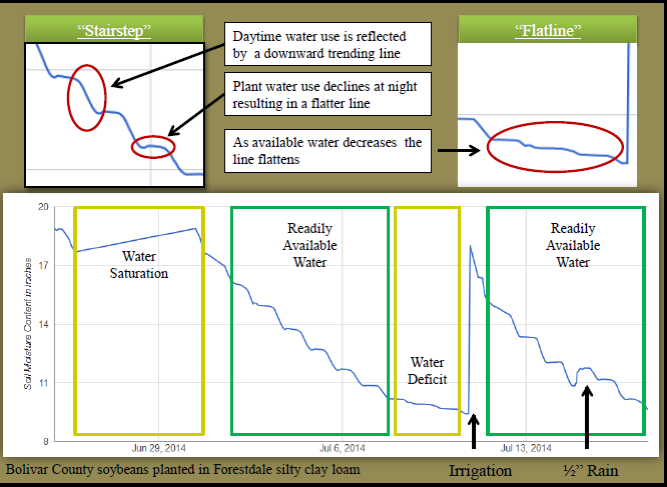 With the HYAS Soil Moisture Solution, you can make informed irrigation decisions that not only conserve water, but help maximize yield potential. 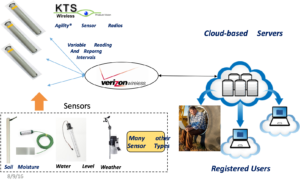 The probes are connected to a KTS Wireless Agility® Sensor Radio (ASR) to send data back to the Agility® IoT Platform server for vis ualization and analysis using the MyFarm Web Application. 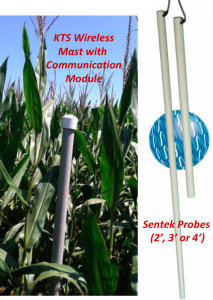 The basic probe provided measures soil moisture and temperature at all sensor depths. Optionally, a more advanced probe can be provided that also measures salinity . The sensors are enclosed in a protective, 1 inch plastic pipe with fully-encapsulated electronics. This rugged design provides many years of use. The probe is dropped into a hole made with a cordless drill and specially- tapered bit. This allows for a high-quality, undisturbed installation completed in just minutes. A single, small cable is routed underground to the mast which is installed within a few feet of the probe. The mast consists of multiple, ‘stacked’, 3 ft sections, typically rising 2 to 12 ft above the ground. A communications module including a meshing radio or cellular modem (or both) is dropped into the top of the mast. This module also includes the antennas and battery to power the site for the entire growing season. Probes can be programmed to collect readings from all sensors every 0.5 to 6 hours and send them to the HYAS secure database. The user has access to all collected data at all times. 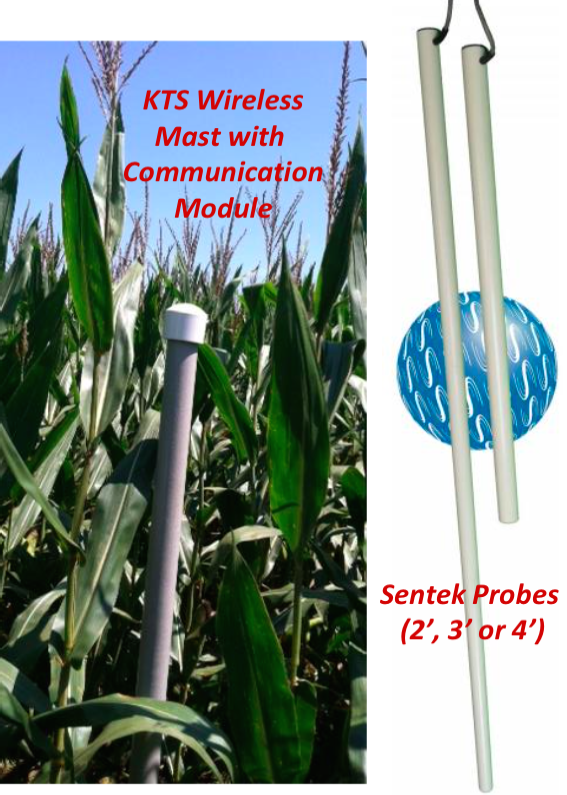 The typical HYAS system is provided with high-resolution, 3 ft, Sentek probes (9 moisture/temperature sensors) and the KTS Wireless Agility Sensor Radio (ASR). The Irrometer probes can also be supported with ASR. Contact your HYAS Dealer for a turnkey solution. This includes not only all the field equipment but also installation, de-installation, storage and wireless network planning services.